Neither gravedigger nor priest are occupations many of us aspire to be, but that’s what you’re forced to choose between in Behold Studios’ game app, The Gravedigger. Both sides are fighting for control of the same area: the gravedigger is cultivating a zombie army, while the priest has the townspeople armed with bats and torches. Your objective, of course, depends on which side you pick. Let’s be the gravedigger for the sake of this review, because who doesn’t want to control some mindless brain-eaters! On campaigns, the objective of each level (16 total) will pop up on the bottom of the screen before it begins. Usually you have to either infect a number of people, survive for a give amount of time, collect objects, or all of them. Tap on a zombie to select it, and tap somewhere on the ground to move the zombie there. Usually the area is bigger than what is shown on your screen, so tap the magnifying glass on the upper left corner to zoom out; tap anywhere to zoom into that spot. To select multiple zombies and move them all together, you can use two fingers to select by drawing out and centering the cluster you want in the resulting box. If you look around, there are houses with numbers on them, an indication of the number of victims the house holds. Send a zombie (just one will do the trick) out to infect, but make sure it stays until the job is done. If it leaves prior to that, then the person inside will remain human. 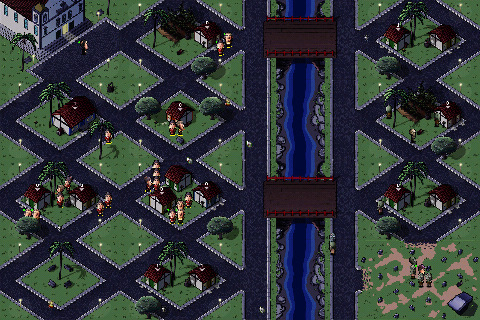 When you encounter townspeople, it means automatic throw-down! Best person or zombie wins, but know that zombies can also infect a person who’s fallen. And don’t forget that back at the graveyard, the gravedigger is making even more zombies to do his bidding. This real-time strategy (RTS) game would probably appeal to people who like choose-your-own-adventure stories, or even just zombie aficionados. It’s always interesting playing a game so based on your own decisions, because no two outcomes are quite the same. The graphics are cartoony enough to wipe any sort of frightening baggage associated with zombie attacks, and the background music evokes a silent adventure movie feel. 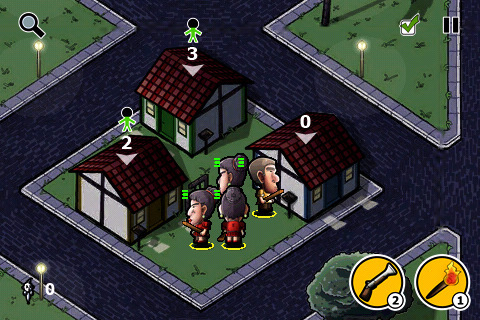 However, the controls are sometimes frustrating, because there is no option to unselect zombies–this often leads to moving your troops somewhere you only intended to take a quick look at by zooming in on it. The automatic attacking that is triggered by being in the vicinity of the enemy is also vexing; no matter how much you want to split up your troops (like the way a relatively bright person would), the enemy group must be completely annihilated before any of the zombies can even be moved elsewhere. How bothersome. The Gravedigger is a solid game and the violence is even funny, but better controls are needed before I can be moved to spend $1.99. AppSafari review of The Gravedigger was written by Julie Guan on September 14th, 2010 and categorized under Action, App Store, Fun, Games, Line Drawing, Resource Management, Strategy, Time Management. Page viewed 4006 times, 2 so far today. Need help on using these apps? Please read the Help Page.